Looking for a variety of used cars for sale in Indiana? Not sure where to start your search when it comes to finding Central Indiana used car dealerships? If so, then you need to come to your local Indiana used car dealerships of Acra Auto Group and see one of the many used cars for sale near you. Acra Auto Group is known for having a large selection of used cars for sale near Indianapolis with many different brands to choose from. Because of this, you are sure to find the used car for sale of your dreams. Here at your local Central Indiana used car dealerships, we have everything from luxury foreign brand vehicles for sale, such as BMW and Mercedes-Benz, to domestic brands for sale including Chevy, Jeep, and Ram. Here at Acra Automotive Group, we understand that getting into a used car in Central Indiana can seem like a never-ending process. Which is why we have a team of friendly and knowledgeable people who are happy to answer any and all questions you may have. Here at the car dealerships of Acra Auto Group, we take the time to get to know you first. This so that we know what you are looking for when it comes to used cars for sale. Because, here at Acra Auto Group, we want you to drive away with a smile on your face and not doubt in mind that you got a vehicle that is going to not only fit you and your families needs but your budget as well. At your local Acra Automotive Group used car dealerships, we have everything from used cars to used trucks, and everything in between. 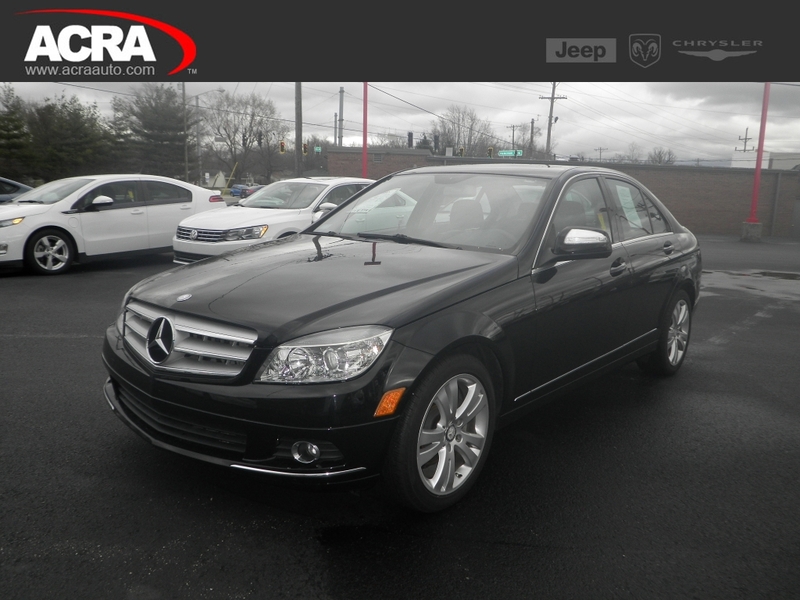 If it is a used luxury car, you are after come and see one of the many impressive vehicles we have to offer including a used 2008 Mercedes-Benz C-Class. This used car for sale comes with many features both inside and out that you will not want to miss. This used car for sale comes with luxurious leather seats, a leather-wrapped steering wheel with steering wheel controls and wireless cell phone hookup. A wireless cell phone hookup makes for easier than ever hands-free calling and texting. This used car for sale offers beautiful wood interiors features, along with exterior chrome accents, giving this used luxury car an extra touch of class. If a luxury used car for sale like the Mercedes-Benz C-Class for sale is not what you are looking for come and see one of the many other used cars for sale in Indiana. Whether you are looking for a luxury used car for sale that is going to turn heads as you drive down the streets or another type of used car for sale, you are sure to find just what you are looking for here at Acra Automotive Group. Come to Acra Auto Group and take one of the many used cars for sale in Indiana on a test drive. When you are wondering where to find a large selection of used cars for sale, the only Central Indiana used car dealership you need is the Acra Auto Group dealerships. You can contact Acra Chrysler Dodge Ram Jeep at 888-604-2722 or come to 1407 North Lincoln Street in Greensburg, Indiana 47240. You can contact the Acra Pre-Owned Superstore in Columbus at 888-356-2272 or visit us at 2820 North National Road, Columbus, Indiana 47201. Acra BuyRite Auto can be reached by calling 877-925-2272 or visit us at 920 North Michigan Avenue, Greensburg, Indiana 47240. Our Shelbyville used car dealership is an Acra Pre-Owned SuperStore and can be reached at 888-318-2272. Or, feel free to stop in at 1200 East State Road 44, Shelbyville, Indiana 46176.